parsley pesto | Mom, How do I make this? Welcome back after the holidays and happy 2012! Sauteed mushroom crostini, cannellini bean and parsley pesto crostini, and prosciutto and fig pizza. I somehow lost the images I took while doing work for this little holiday party we had, so forgive me. We’re talking about probably 30 crostinis total and one pizza, cut into small thin personal pieces. If you need more, double the recipe. Really good olive oil, first pressed. I’m partial to this type, which my mom sells at Dunning’s Market, if you are in the Chicago area you can buy it there, or they sell it here in Brooklyn. Figs, preferably fresh but they’re not in season so get dried and I’ll teach you how my mom told me to reconstitute them. 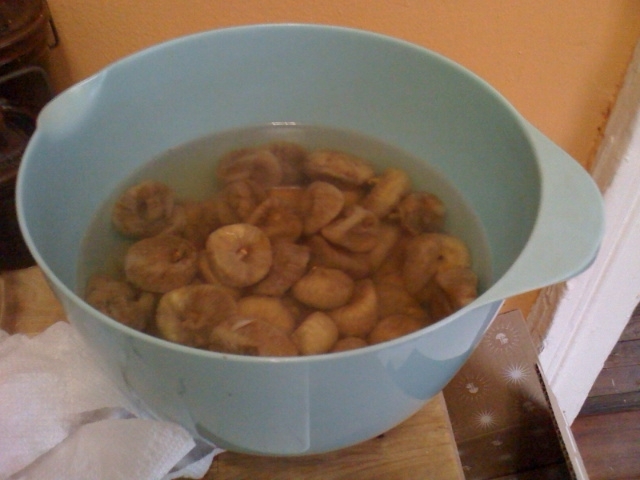 Boil water and submerge the dried figs for about an hour until they puff up slightly from where they were. You’re going to make two at the same time. Turn on your oven to 350. Slice the baguettes into small ovals and spread them out on large cookie sheets. Wash olive oil over the bread, salt and pepper it. Put it in the oven and keep watch, it takes about 15 minutes and you don’t want them too crispy. Yours won’t have grill marks, but you get the idea. Cook the beans the night before so they’re already done, or if they are canned, don’t sweat it. dice both bunches of parsley. Set aside two generous handfuls. Toss some olive oil in a saute pan (the kind I showed you a few weeks ago or something similar) and throw in the garlic, and a small handful of parsley, let it brown a few minutes and then toss in the mushrooms and let them sweat. Turn the heat down, medium to low. While they are cooking, put the remaining parsley into a food processor with 1 clove fresh garlic, salt and pepper and a generous amount of olive oil. The pesto should be oily but not soupy. Blend until it’s a paste. Add about four large handfuls of pecorino romano. Combine the pesto and the beans in a seperate bowl. Et voila. Meanwhile, your mushrooms are cooking, cooking, cooking down. They start to smell really good. Add some salt and pepper. When they are 1/2 their size, or even smaller, turn it off and add a handful of cheese, and then another 1/2 handful. Let them rest. The mushrooms will turn a deeply rich color of brown. Remove the bread and spread the mixtures on the bread. Use your remaining handful off parsley to garnish. Pizza: Credit for this belongs to my sister, Claudia. Genius idea. Rub olive oil on the flat bread and bake in 350 oven for 10 minutes, alone, remove. Slice shallots and carmelize (which means saute slowly, with olive oil until they are translucent and soft and smell sweet) This process will take about 15 minutes or so at a medium heat. Olive oil, shallots, 1/2 rosemary prosciutto figs, then mozarella on the top and 1/2 rosemary. Bake until the cheese is brown and bubbly. Let it sit and serve in slices. I can’t believe I don’t have a photo, it was so beautiful!